As most seasoned travelers will tell you, last minute trips are the best kind of trips. They leave room for spontaneity, uncertainty, and plenty of adventure. 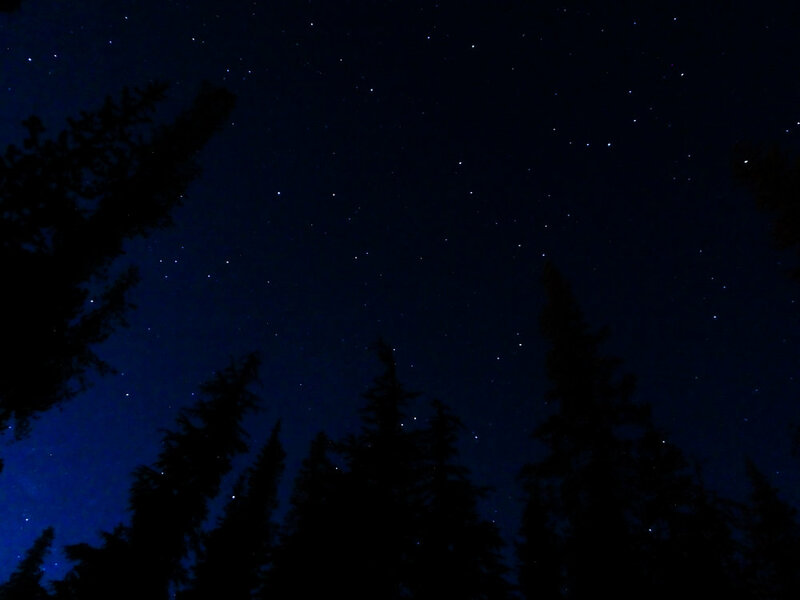 Such was the case with our spontaneous 12-hour camping trip at Crater Lake National Park. To provide a brief background, Derrick and I had just 3-days to drive from our house-sit in California to our next house-sit in Victoria, BC, Canada. This timeline was completely reasonable for a direct route, but we knew exploring along the way would be nearly impossible. "Challenge accepted!" Derrick inwardly thought at some point during the planning of the aforementioned direct route. 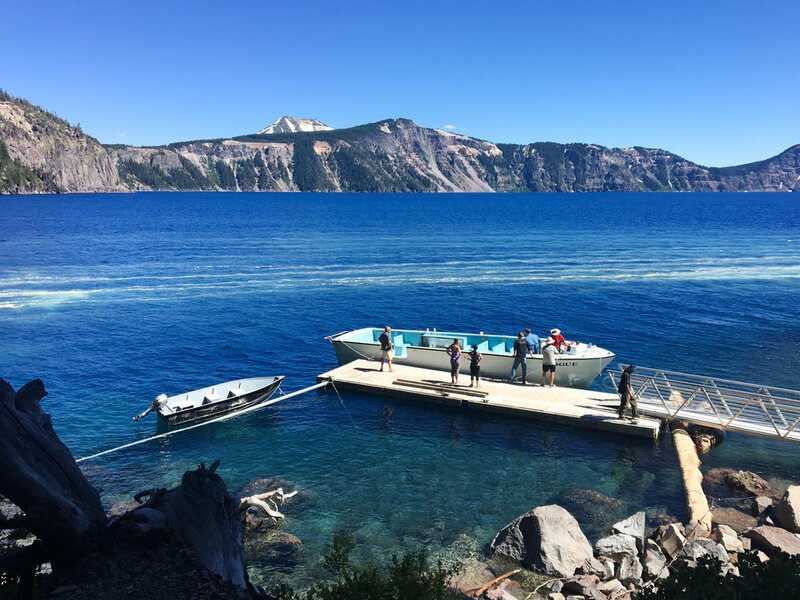 After saying goodbye to friends and family in the Bay Area, we packed up our Jeep and hit the road with a detour destination of Crater Lake National Park. It was a spontaneous decision made just days before we arrived, but as I continue to learn, last minute is often the best minute in which to plan...sometimes. Crater Lake is in a very remote location, so the National Park offers overnight cabins, a campground, a restaurant, and a camp store, all within a few feet of the entrance station. During our research, Derrick had found a dispersed campground within the park that was cheaper than the main campground but still accessible by car. Upon arriving at Crater Lake, our plan was to camp there, but that quickly changed as we narrowly missed a head-on collision with a road closure gate. Remember what I said earlier about last minute planning? It can lead to plenty of surprises as well! 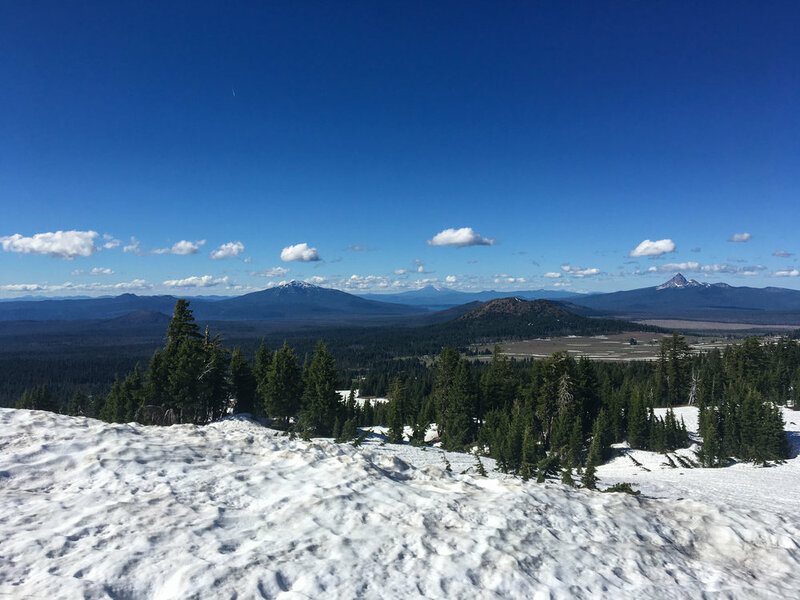 When planning our trip to Crater Lake at the end of July, we hadn't even considered snow to be a factor. Spoiler alert, snow was a factor. A deep, cold, plan-derailing factor. We came to learn that more than half of the perimeter road around the lake was still buried in snow from the winter. This meant various view points we'd planned on seeing, and the campsite at which we'd planned on staying, were all inaccessible. We were determined to still explore the parts of the park that had thawed so we begrudgingly turned around and reserved a site at the main campground for the night. We were picturing a very touristy, almost KOA style campground, but were pleasantly surprised by the overall experience. The sites were close to one another so the park can accommodate an influx of visitors throughout the season, but the campground itself was a tree-filled, no-frills, oasis. It even had a camp store stocked with anything you may have forgotten from civilization, including an impressive selection of locally-brewed Oregon craft beer in their cooler. After setting up camp, we reviewed all of the road and trail closures and revised our plan for the afternoon. Luckily, the parts of the park that were still open offered incredible views and plenty of trails to still explore. We came to realize that Crater Lake is very aptly named. The lake sits where a volcano used to stand before it erupted and collapsed nearly 7,700 years ago. 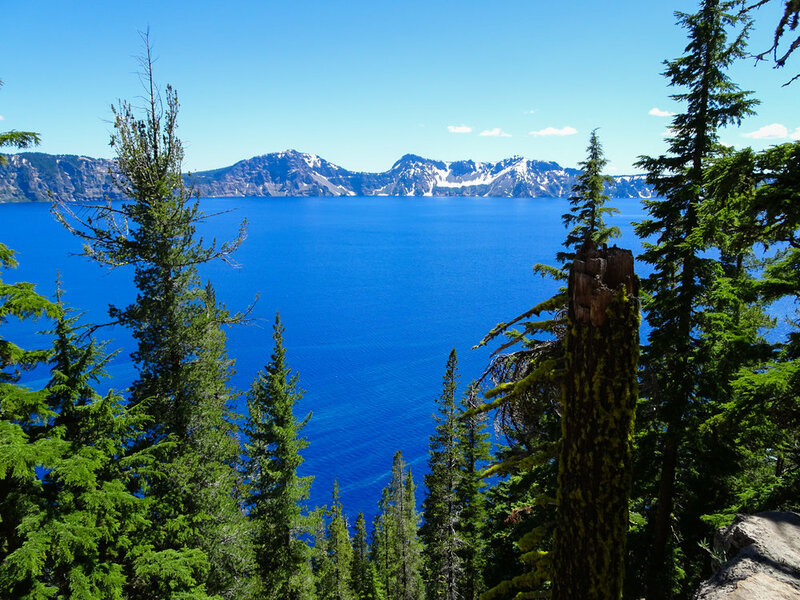 This implosion caused a massive crater that eventually filled up with rain water and snow melt and created what is modern-day Crater Lake National Park. At 1,949 ft deep, Crater Lake is the deepest lake in North America. I didn't know this kid, but he was happy to pose for the picture! Of course, we knew none of this before arriving, so we were shocked and impressed when we first saw it. The water in the lake is bluer than any we'd ever seen, and we'd just come from Tahoe, a lake we'd thought would forever hold that title. The depth has a lot to do with the rich blue color, but we also learned that the only water feeding the lake was rain and snow melt and that no rivers or waterfalls contribute to it. This meant there was very little natural debris or sediment. Not to mention the entire lake is set about 500+ ft below the road and visitor areas, and all of the human and boat traffic is regulated by rangers and volunteers. We chose to hike the Cleetwood Cove Trail, the only one trail in the entire park that leads down to the lake. The hike down is short but steep and leads to the only boat launch (for tour boats) and swimming area on the lake. We were surprised that we were even allowed to swim given how pristine the water was. Of course, I forgot my bathing suit and didn't want to make the climb back up to get it, but that just meant I was able to capture Derrick doing his signature back flip into the clear blue water below. After enjoying an hour on what felt like a tropical beach (minus the cold water) we made the steep climb back up to the car and spent the rest of the night at our campsite. Our final spontaneous decision was to wake up at 5:00 am to catch the sunrise over the lake. We'd clocked the drive from the campsite to the popular sunrise overlook the night before and found we needed about 20 minutes in the morning to get our asses in gear in time for the sunrise. Neither one of us is a morning person, but seeing the sunrise over the lake made the dawn adventure worth it. In our opinion, that's the only way to wake up at Crater Lake! 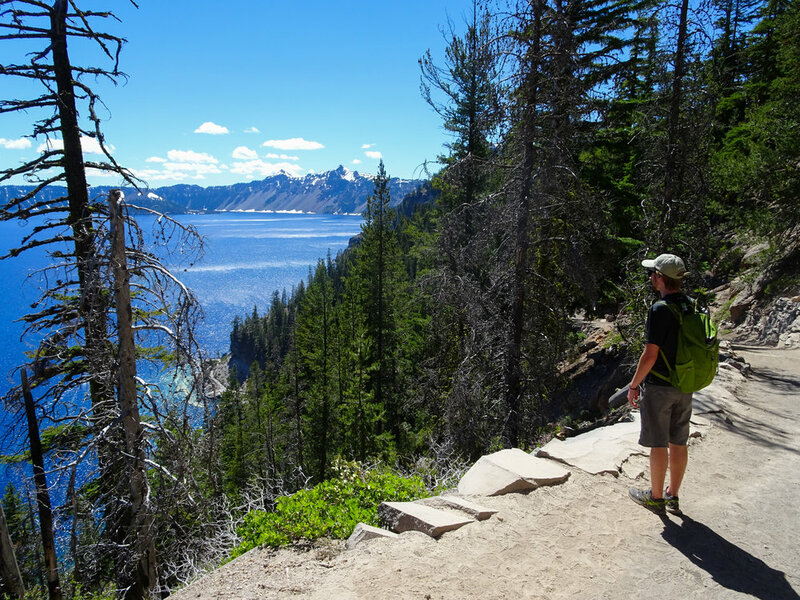 Overall, we'd recommend spending a lot more time at Crater Lake than we did. Even with the closures, we could've spent days exploring the trails and viewpoints around the park. 12 hours felt like just a teaser and we weren't ready to leave the next morning. If you visit toward the end of the summer or in the early fall, the entire park will be accessible and you'll likely need a few days to fully enjoy all it has to offer. Spontaneously or otherwise!